There’s an old sawhorse that we learn more from our mistakes than our successes, but there’s a reason it’s often-repeated: it’s true. When things don’t come together just right, you learn how to do them better in the future. 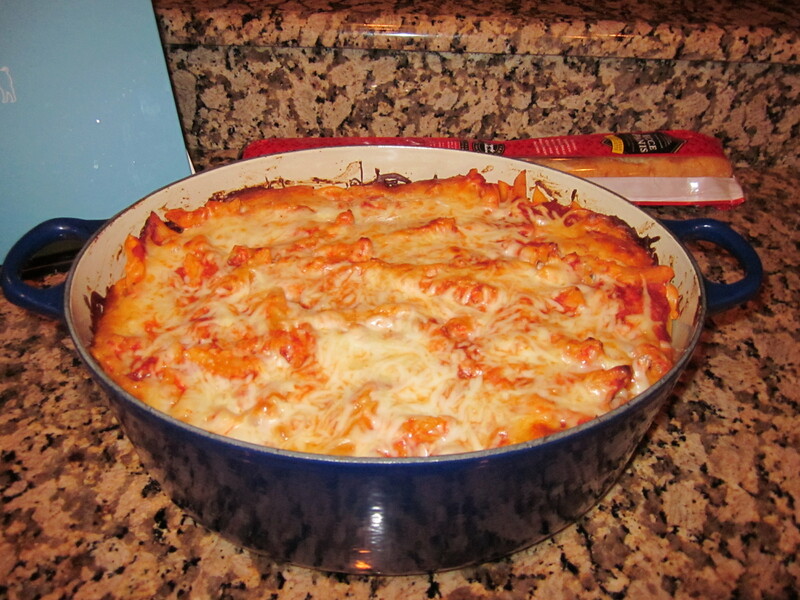 For the Monday night gamers, I intended to put together a nice, easy baked ziti, and what I got was damned by the faint praise of it being merely edible–something they wouldn’t remember for being particularly tasty, but at least it wouldn’t be the memory of something terrible. Small victory indeed. I made a pot of sauce, but you can certainly use what you’ve previously made or what’s available. I’m not against the idea of sauce out of a jar, it’s just that most of the them aren’t that good. I’ll get into how we make our sauce at some other point in the future. The dish is relatively simple to construct. About the time the sauce was finishing up, I started cooking the pasta. The box called for 11 minutes, so knowing that it was going in the oven, I cooked it about 9, just until it was a little toothy. I drained the pasta, and before it got dry, I mixed it with the ricotta, until the pasta was coated and creamy. I then stirred in ¾ of the mozzarella and enough sauce (a little more than a quart, about a third of what I made) to make the whole mixture moist, and finally stirred in the nutmeg. I layered a little more of the sauce on the bottom of the large Dutch oven, then folded in the pasta mixture, distributing it evenly in the pot. I ladled more sauce across the top, a thin layer to completely cover it and hold the remainder of the cheese. I then baked it in the oven for about 55 minutes as 375F. When it came out of the oven, I let it stand for a few minutes. I dished it up and topped it with a bit more sauce. For six large servings, I still had a fair amount of the sauce left over (not to mention at least a second meal left). The guys ate it without complaint, but since they normally rave about the food, I knew this had missed the mark. Again, it was perfectly edible, but also completely unmemorable. I know that not every dish can be a world-beater, but I’d also like none of them to be forgettable. The mistake I made was using too much pasta. I used three pounds instead of two (which is why I bumped back the recipe), and it spread the cheese and sauce mixture too thinly. 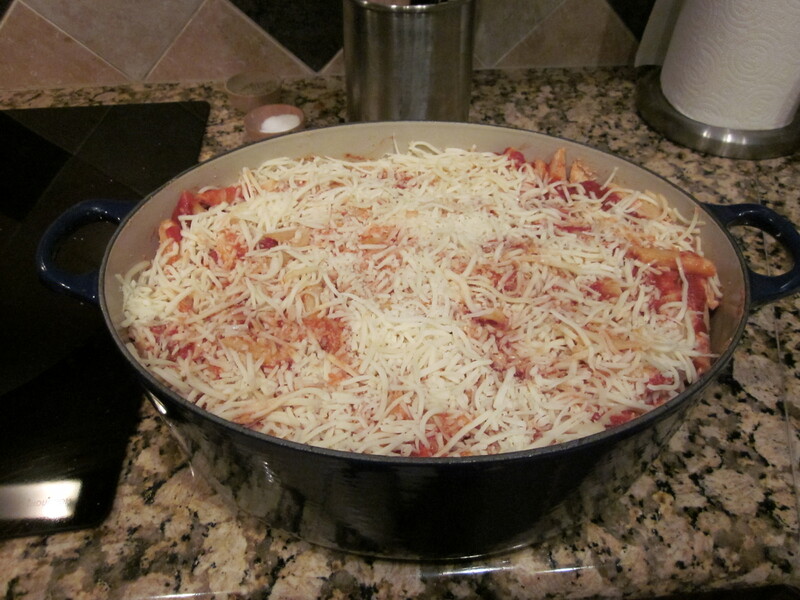 It looked fine when it came out, but I wasn’t happy with the pasta-to-cheese ratio when we ate it. Avoiding the third pound of pasta (or adding a third pound of each cheese, if you’re serving a football team) would have given it the taste balance I was looking for. I think I would have also liked to integrate Italian sausage into the dish instead of serving it on the side. I also wasn’t overwhelmed with the sauce I had made, but that came from the fact that I rushed it a little bit to get the pasta dish going. In the future, I’ll make the sauce the day before using in a dish like this. Learning to do something right often involves learning how to do it wrong. The lesson of failing to hit what you’re aiming for has the value of improving your targeting, so on the next shot you get closer to the bulls-eye. Lesson well learned here. Sheldon Menery is a self-taught food and wine aficionado who has circled the globe in search of the riches it has to offer. He's wined and dined at some of the best (and worst) places in the world. This entry was posted in Food We Make. Bookmark the permalink. Sheldon, I look forward to seeing your sauce recipe. Tomato sauce is one of my all time favorite things and I have accumulated several recipes from different sources, all of them delicious in their own ways. I can’t wait to trying yours!